independent transport videos follow up their filming of Routemasters in their 50th birthday year with further pursuits across London. The first filming session in January 2005 concentrates on route 36 from New Cross Gate up to Queens Park. We start outside New Cross bus garage and have a brief ride to Peckham on RM1062. We continue along Peckham Road, passing the High Street and Rye Lane (site of a former LT bus garage) towards Camberwell Green. Routemasters are featured passing both Camberwell bus garage and Walworth which has recently reopened for use by Travel London. From here we head up to the new Vauxhall bus station and capture the comings and goings at this interesting site. We briefly retrace our steps back to the Oval where 159s are seen crossing the paths of the 36s. The final part of this session returns to Vauxhall bus station and continues across Vauxhall Bridge to Victoria. 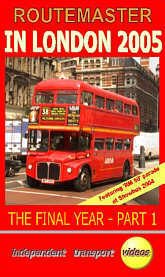 The second session of this film traces the last Routemasters operated by London General on the 14s and 22s. Initially we take a 38 (RML2688) from Victoria to Tottenham Court Road before catching up with the 14s that turn at this point. We trace our steps through ‘Theatreland’ to Piccadilly Circus and Lower Regent Street, where we join up with the 22s. At Waterloo Place we see the 22s mixing with the 13s and 159s that also serve this part of the West End. After filming along Piccadilly we take a ride on RML2590 serving the 22 to Putney Common. At Putney Common we film the turning point as well as some Routemaster successors which are beginning to replace those that don’t survive until their last day of service. We take a brief ride on RML2593 to Putney Bridge before filming RMLs in the Putney ‘environs’ as well as outside the bus garage. A further brief ride takes us on a 14 to the Green Man at Putney Heath which is the outer turning point for this route. We return to the centre of London and stop off at South Kensington where we capture the RMLs with the grand Georgian and Victorian buildings of the area as a backdrop. We briefly end the day’s filming back at Victoria. Make the most of this action capturing what is becoming a rare breed in its final year of regular service on the long established bus network. However we must not forget the expected introduction of the heritage routes to be operated by Stagecoach and First Group later in the year. Duration : 96 minutes (approx).